Getting the Extra Value Without Paying the Extra Price. It is a little known fact that Chrysler cut some corners while building the 1991 through 1995 Jeep Wrangler production lines. To help cut the cost of making two separate gas tanks for the 14.9 gallon and the 19.7 gallon tanks, Chrysler used one tank for both and extended the fill vent tube down into the tank. This causes the gas pump to think the tank is shallower than it actually is and turn off before being truly full. I'm sure some of you who are reading this have squeezed more than 15 gallons of gas at one time or another but did not know why or thought the engine was running on vapors. Well, in reality the tank was never full to begin with. We first learned about this from our friend Ben "Obi-Wan" Hollingsworth a few years back. With help from him, we will walk you through the steps so you too can get more miles out of your Jeep with fewer trips to the pump. The first thing we need to do is drive the Jeep around until there is about one quarter or less of gas in the tank. This makes working much easier since there are less gas fumes in the tank and the workarea. The next step is to remove the gas cap to release any pressure which might be inside the tank. Since we will be working around the gas tank opening, this is important. Once the pressure has been released, we can start off by removing the plastic shroud that covers the underside of the fender and wheel well. To remove this we remove the four plastic rivets. There are three that are visible from inside the wheel well and another on the back edge of the rear fender. To remove these, we have to use pliers and pull the plastic pin partially out from the center, making sure to press the washer part firmly against the shroud. This should release the rivet, but sometimes the pin comes completely out. This is not a problem since these can easily be reinserted once the rest of it is out. Now, looking up at the back side of the filler protector there are two hoses. One is roughly 1.5" in diameter. That is the filler hose that runs from the filler neck into the tank. 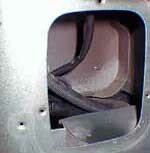 The vent hose is the rearmost connection to the gas tank. Now there are two ways to do the next step. One is to lower the tank which means going through a few extra steps. The other does not require the tank to be moved. We'll choose the easier route, which means going through the filler neck hole. To do this we need to remove the license plate holder and gas filler housing. Because the license plate frame is spring loaded, you need to wedge something between the two sides to keep them from snapping closed when it is removed. Once the license plate holder is removed we unbolt the filler neck from the filler protector and remove it. Now we have the filler neck exposed so we could easily get to the two hose clamps that hold the filler hose and vent hose to the filler neck. After removing both clamps, the filler neck comes out easily. 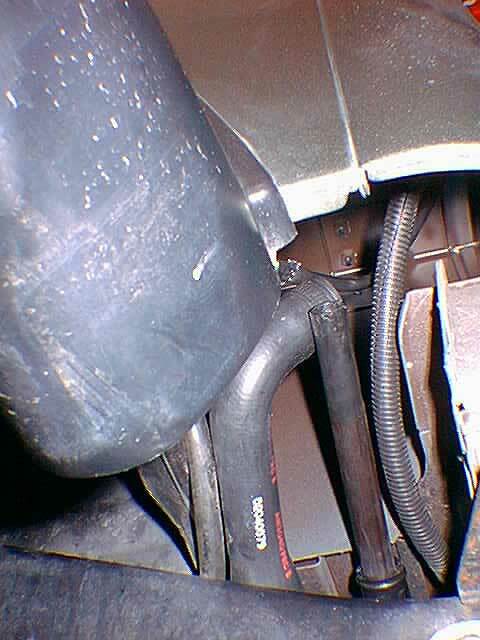 The reason for removing the filler neck is to be able to gain greater access in the small space by bending the filler hose up and out of the way. It may also be a good idea to stuff a rag into the filler hose so no dirt will enter the gas tank. The gas filler hose is the large hose on the left. The vent hose was on the right. We are now ready to get down to business. By removing the hose clamp on the vent hose we are able to remove it and expose the vent tube. It is sometimes difficult to see, but there is a tube inside the small neck of the gas tank. This is the vent tube that we talked about earlier. The tube is about ten inches long, eight of that drops into the tank Now the tube sits flush against the tanks vent. To remove it, we work a standard screwdriver between the two. This deforms the vent tube enough that needle nose pliers are able to grab the tube. After several tries we can pull the tube out about two inches. When it is out that far, grab it with the hands and pull it out the rest of the way. Now we have few choices, to cut the tube down or to just leave it out all together. There is no real reason why it should be there in the first place, but we decide to cut the tube down to three inches and reinsert the rest back into the tank. This will give us a true twenty gallon tank If for some reason we did not want to use the full potential of the gas tank, we could have cut the vent tube to any size. This would change the capacity of the tank to something below twenty gallons. Now that the tube was done all we had to do was to walk backwards through the steps to get everything back together. This will take around another fifteen minutes or so to do. 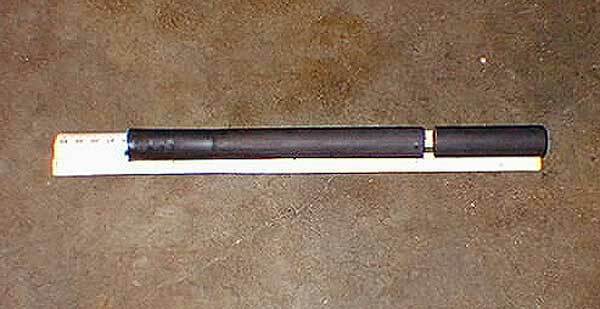 The filler vent tube right before it is pulled from the tank. 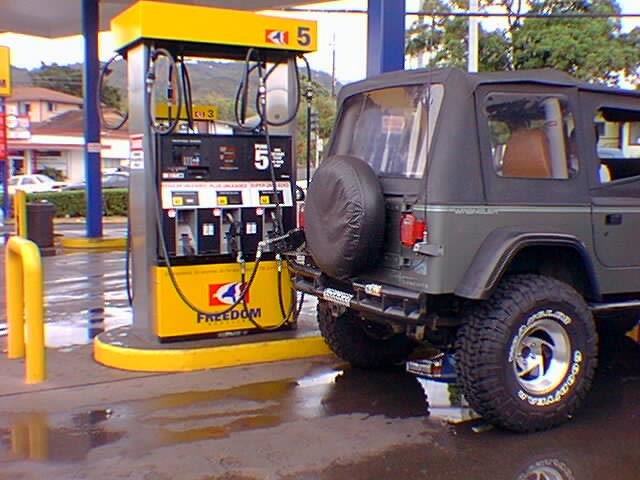 After we did this conversion ourselves, we drove the Jeep down to the nearest gas station and proceeded to fill up on some 87. Five gallons, ten gallons, fifteen and then the pump clicked off at just past eighteen gallons! (*remember there is some gas still in the gas tank.) So we were able to add another five gallons to the capacity of the gas tank and it cost us nothing but a half hour of time. Here is the only downside to the project. Once full the gas gauge read past "F". This is because the tank still had the fifteen gallon sending unit. We could have bought a new twenty gallon sending unit but that would of added $219 to the project but we wanted to keep the cost down (i.e.., No cost.) With the fifteen gallon sending unit, the gauge read "F" until the first five gallon of gas had been used. After that the gauge worked as it normally did. We're sure many of you readers out there are wondering if this is possible with the older Wrangler's (YJ's 1987 to 1990.) Well, this will not work since the older fifteen gallon tank is in fact smaller and only holds that amount. The other group that are probably asking the same question are the newer Wrangler owners (TJ's 1997 to present.) After talking to a few people, we were able to find out that it may in fact be possible. This is second hand information since we have not had a chance to confirm this. From what our friend Eric Denning has said, it will work. Unlike the YJ in our project, the TJ's have the filler tube molded into the tank. (This was verified by a few people.) To get to the tube you must lower the gas tank and gain access though the sending unit hole on the top of the tank. Once access is gained Eric was able to use PVC cutters and cut the filler tube as closely to the top as possible. Again, we have not actually tried this but would really like to hear anyone has tried it. This is the uncut tube. 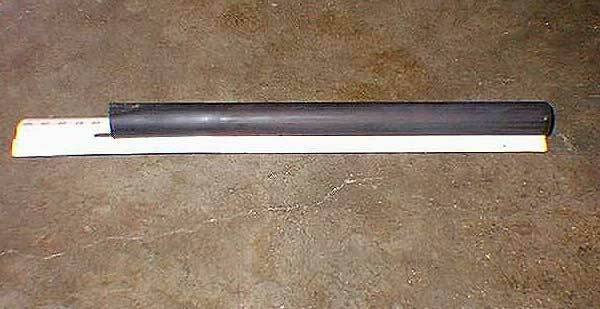 It measures around 10 inches in length. The 3 inch piece on the right was reinserted into the tank.